Corporate profit growth is decelerating -- and at significantly quickening pace. 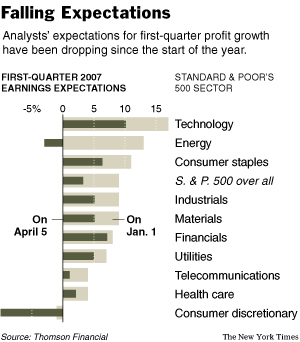 So, too, are earnings expectations for the coming year. As noted earlier this week, the S&P500 double digit year over year profit streak has ended. "After increasing at a double-digit rate for several years, earnings for companies in the S.& P. 500-stock index are expected to grow by only 3.3 percent in the first quarter of 2007, according to Thomson Financial. This represents a huge drop in expectations, as Wall Street analysts at the start of this year were expecting a first-quarter growth rate of 8.7 percent. The second quarter doesn’t look much stronger: analysts are predicting profit growth of just 3.5 percent. And after soaring 16 percent last year, corporate earnings for the full year are expected to increase by only 6.3 percent. “Analysts have pretty much cut their forecasts in half for the year,” says Jack A. Ablin, chief investment officer at Harris Private Bank in Chicago." Historically, earnings growth runs about 7% -- roughly the combination of inflation and GDP. Mean reversion, however, does not simply return a measure to its historical average. Rather, it oscillates above and below. While 6.3% is a respectable number for earnings growth, it is important to note that the profit growth is a cyclical phenomena, swinging wildly above (+28% a few years ago) and wildly below (minus 25% a few years before that). The S&P's Sam Stovall looked at prior eras of earnings growth deceleration from 1966 to 2000. The Times notes that "in 4 of the last 10 such periods, the S.& P. 500 lost value. But this means that in a majority of cases, stock prices still managed to climb in the face of slowing profits. In fact, the average gain for the S.& P. 500 during these slowing periods was a respectable 7 percent." That 34 year period niucely encompasses two major secular periods -- a major Bear market (1966-82) and a major Bull market (1982-2000). I would be quite curious to see how the breakdowns of positive and negative returns relative to earnings growth correlated to these different periods. (We are presently in a secular Bear market, running from 2000- 20??). As the article further notes, its "not just the rate of earnings growth, but also the underlying trends." We would much rather buy low earnings growth -- but when its on the upswing -- versus medium earnings growth on the downswing. "Periods when the earnings growth is high but falling tend to be challenging for the market, [Tim Hayes, chief investment strategist at Ned Davis Research] said. It’s during these periods, he said, that “the market begins to question the sustainability of earnings growth.” And “the market becomes vulnerable to disappointments,” he added. Despite the swoon in stock prices in late February, the markets haven’t come close to pricing in the coming earnings slowdown, in the view of Richard Bernstein, chief investment strategist at Merrill Lynch. “What’s happening now is an odd situation where earnings growth looks like it’s slowing, but people are hesitant to make that bet because every time they’ve made that bet in the recent past, earnings have surprised to the upside,” Mr. Bernstein said. For the last 15 of the last 16 quarters, analysts’ estimates for earnings growth have turned out to be too pessimistic. And Mr. Thompson added that analysts have recently underestimated actual earnings by around 3 percent. “It’s now almost become a Pavlovian response,” Mr. Bernstein said, where investors immediately bet on better-than-expected earnings once analysts post their forecasts." Since we mentioned the recency effect yesterday, consider this: in terms of profit growth, both the most recnet data point AND the overall trend are pointing in the same direction: downwards. A Caution Signal on Profits. A Red Light for Stocks? "(We are presently in a secular Bear market, running from 2000- 20??)." Oh, and I thought I read Bernstein recently RAISING his expectation for the S&P this year to ~12% by year end?? Kindly share the whole picture in this regard. BR: Frankie -- you will note that I fastidiously cite and link every resource, quote and attribution I make. If you are going to quote someone like Merrill Lynch's Richard Bernstein, please include a link or at least some citation. As to the Secular issue, have a look at this 100 Year Dow Jones Industrials Chart, and then get back to me . . .